Mets fans may have seen the last of Jose Reyes' headfirst slide. We’ll know in a few months whether Wednesday marked the end of Jose Reyes’ Mets career. Let’s take a look at some of the highlights of his excitement-filled nine-season tenure, with some help from Baseball-Reference.com. Reyes made his major-league debut one day before his 20th birthday, on June 10, 2003 against the Rangers, singled in his first at-bat against John Thomson, and went 2-for-4 in a 9-7 loss. It was supposed to be a two-week temporary stay for Reyes, who had been recalled when shortstop Rey Sanchez was placed on the disabled list. He made it last a lot longer. Back at shortstop in 2005 after a disastrous, injury-altered season at second base in 2004, Reyes started the 2005 season on a tear. He had three hits in an Opening Day loss to the Reds, three more hits in the first win of the season against the Braves. On April 13 against the Astros, he’d snap a 0-0 tie in the 11th inning with a single that scored Chris Woodward. It is to this point the only walk-off hit of Reyes’ major league career. Professor Reyes says …Reyes never hit a walk-off home run as a Met, though he did hit one in an exhibition game featuring MLB All-Stars against their Japanese counterparts in November, 2006. 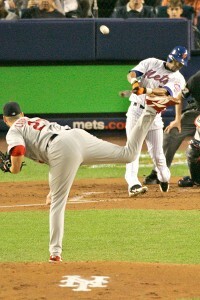 The 2006 season was Reyes’ best as a Met. He hit .300 with 19 home runs, 17 triples, 122 runs scored, and 64 stolen bases. Reyes had just about every type of game that a hitter could have that season. In an 8-7, 14-inning win over the Braves on May 5, he had five hits. In a 6-5 loss to the Reds on June 21, Reyes hit for the cycle, getting a single in the bottom of the eighth inning to complete the feat. Then, in a surprising display of power, Reyes smacked three home runs in an 11-4 loss to the Phillies. Professor Reyes says …Reyes and original Met Jim Hickman are the only players in team history to have a three-homer game, a five-hit game, and hit for the cycle in their careers with the team. Reyes became the first player in major league history to have all three in the same season. With someone like Darryl Strawberry, there was the feeling that at any time he could launch a monstrous home run. With Reyes, there was a sense of anticipation that he could hit an inside-the-park home run. He actually only did it once, on September 7, 2006 in the sixth inning of a game at home against the Dodgers. Reyes hit a fly ball off the center field fence that eluded Matt Kemp and brought home three runs, Reyes included. Media reports noted that Reyes flew around the bases in 14.06 seconds. Professor Reyes says …Reyes home run was the seventh and last inside-the-park home run hit by a Met at Shea Stadium. With the Mets down 3-games-to-2 in the 2006 NLCS, Reyes led off the bottom of the first inning with a home run against Cardinals ace Chris Carpenter. Jose Reyes made one postseason appearance in his first nine seasons with the Mets. It was a tone-setting home run, part of a 3-for-4 day in a 4-2 Mets win, one oft-forgotten because of the Mets loss to the Cardinals in Game 7. On July 20, 2008, Reyes tripled to right center in Cincinnati against Reds pitcher Edinson Volquez for his 63rd career triple, breaking Mookie Wilson’s Mets record. The triple became Reyes’ trademark. He’d hit 99 of them in his first nine seasons, leading the National League four times. Professor Reyes says …Reyes ranks second in triples in the first nine seasons of a career, among players whose careers began after World War II ended in 1945. The only player with more is Carl Crawford, who had 105. In the third inning of a 13-10 win over the Nationals on September 10, 2008, Reyes broke another Mets mark with his 282nd steal, again surpassing Wilson. The steal was another Reyes trademark. He led the NL in stolen bases in three straight seasons from 2005 to 2007. 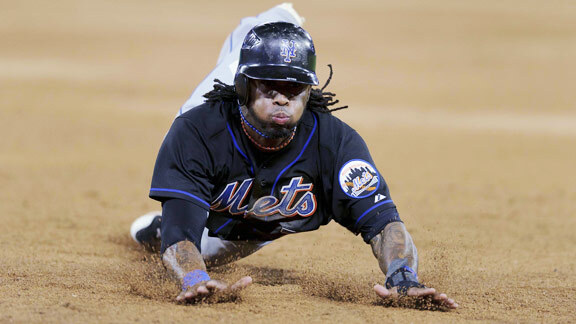 Professor Reyes says …Reyes is the only player in Mets history to lead the National League in stolen bases. There are few with greater villain status in Mets history than Roger Clemens and Reyes put a capper on Clemens’ time against the Mets on June 15, 2007. Reyes went 3-for-3 against Clemens with both RBI, one coming on a fifth-inning home run. Professor Reyes says …Reyes is the Mets all-time leader in multi-hit games, three-hit games, and four-hit games. On April 17, 2010, the Mets and Cardinals went head-to-head for 20 brutal innings in St. Louis. It’s a footnote in Reyes’ terrific career that he’ll be known as the player who got the game-winning RBI in that marathon, a sacrifice fly against utility-man-turned-pitcher Joe Mather in the 20th inning. Professor Reyes says …The 20th inning is the latest into a game that a Mets hitter has driven in a run. Despite twice being sidelined by hamstring injuries, Reyes had a fantastic 2011, taking the NL batting race to the final day of the season. If this was the capper to his Mets career, it was a heck of a way to finish, though the ending was rather abrupt. Reyes had two home runs in the next-to-last day of the season, than reached via bunt single in the final game before being pulled in an attempt to protect his batting title lead. Professor Reyes says … Reyes, the all-time team leader in runs scored, steals, and triples, has 1,300 hits in his Mets career, second-most in team history. Should he stay, he would likely break Ed Kranepool's club record of 1,418 hits.